DANIEL J. FOX, Ph.D., has been treating and specializing in the treatment and assessment of individuals with personality disorders for the last 14 years in the state and federal prison system, universities, and in private practice. He is a licensed psychologist in the state of Texas and has published several articles on personality, ethics, and neurofeedback. 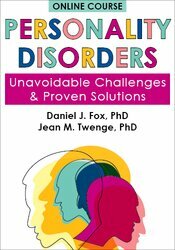 He is the author of The Clinician’s Guide to Diagnosis and Treatment of Personality Disorders (PESI, 2013), Antisocial, Borderline, Narcissistic and Histrionic Workbook (PESI, 2015) and Narcissistic Personality Disorder Toolbox (PESI, 2018). His specialty areas include personality disorders, ethics and emotional intelligence. Dr. Fox has been teaching and supervising students for the last 13 years at various universities across the country, some of which include West Virginia University, Texas A&M University, University of Houston, Sam Houston State University, and Florida State University. He is a staff psychologist at the Federal Detention Center in Houston, Texas, adjunct assistant professor at University of Houston, as well as maintaining a private practice that specializes in working with difficult clients. 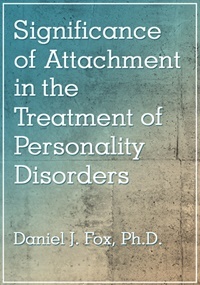 Dr. Fox has given numerous workshops and seminars on ethics and personality disorders, personality disorders and crime, emotional intelligence, managing mental health within the prison system and others. Financial: Daniel Fox is in private practice. He receives royalties as an author for PESI Publishing & Media. Dr. Fox receives a speaking honorarium from PESI, Inc. Non-financial: Daniel Fox has no relevant non-financial relationship to disclose.